Despite the increased interest in dividends these days, you don't hear much about dividend-based valuation methods. While the more popular discounted cash flow valuation methods are instructive in their own ways, dividend-based valuation models are also worthy of consideration. For one, dividend-based models measure actual cash outflows to the investor rather than potential cash outflows (free cash flow). In addition, they assume the perspective of the minority investor (you and me) instead of a controlling shareholder. Finally, dividend payouts tend to be less volatile than free cash flow on a year-to-year basis. Like any valuation method, dividend-based models do have their drawbacks, the most obvious being the challenge of valuing non-dividend paying companies. Further, in order for a dividend model to be appropriate, there must be a clear relationship between the company's underlying profitability and dividend payout. The model is best applied to companies with a target dividend payout ratio (or cover), that pay out a significant percentage of earnings as dividends, and that have a track record of increasing their dividends alongside higher profits. 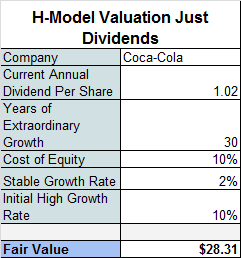 Today, we'll use the dividend-based "H-Model" to value Coca-Cola. Before we start, I must stress that this exercise is for illustrative purposes only and not a recommendation to buy or sell Coca-Cola. The first half of the equation represents the company's intrinsic value assuming stable growth going forward, while the second half of the equation captures the value of the company's extraordinary growth potential. 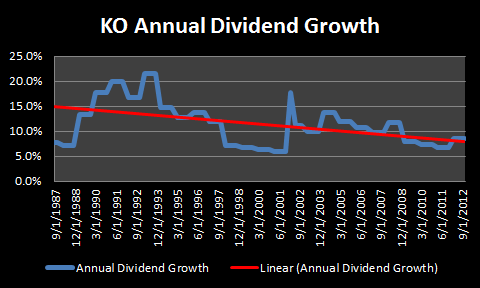 The H-Model assumes a linear decline in the company's dividend growth rate over time until it reaches a stable growth rate (the growth rate of the larger economy). Let's jump right into it by plugging numbers and assumptions into the H-Model. We know for a fact that the trailing-twelve month dividend per share figure is $1.02. That's the one indisputable fact in the formula and the rest are the assumptions. For years of extraordinary growth, it's important to consider the strength of the company's competitive advantages. Few companies will be able to grow their dividend payouts at a pace significantly higher than the economy's growth rate for thirty years, but Coca-Cola's brands and efficient distribution network are exceptional. Thirty years of above-stable growth may still be aggressive, but we can account for different scenarios later on. Most companies will fall into the 10-20 year range, again depending on the strength of their competitive advantages. For cost of equity, 10% is a good starting point for large companies with average uncertainty. A smaller company, or a large company with higher uncertainty, may require a cost of equity of 12% or more. Again, we can account for different costs of equity in a scenario analysis. Finally, for the initial high growth rate, you can base it on the average annual dividend increase over the past three or five years, the sustainable growth rate (discussed here), or the most recent dividend increase as long as it isn't too out of the ordinary. For Coca-Cola, we'll use the most recent dividend increase of 10% as a starting point. With this fair value estimate in hand, we can compare it to the current market price to determine if today is a fair buying opportunity. As of February 22, Coca-Cola shares traded for $38.52 --136% of our fair value estimate. At first glance, then, Coca-Cola does not seem to be an attractive buy today. Based on Coca-Cola's 2012 EPS of $1.97, this result would imply a P/E of 14.8 times. This is significantly lower than the company's five-year average P/E of about 18 times. As we know, buybacks have become an increasingly important way for companies to return shareholder cash. Even though we might prefer dividends to buybacks, it's nevertheless instructive to consider buybacks as part of the total payout per share, as buybacks can be considered part of a company's cash return to shareholders. Because a company's buyback activity tends to ebb and flow over time, determining a reliable "buybacks per share" figure can be tricky. If you simply take buybacks in a given year and divide by shares outstanding, for instance, the baseline figure could be too high or too low. Since we are assuming a total payout per share figure that accounts for both dividend and buyback growth, we also must reduce our initial growth assumptions for the model. The reason for this is we're accounting for the company paying out a larger percentage of earnings to shareholders, leaving less to reinvest in the business. Holding return on equity steady, this would result in a lower growth rate. For this example, we'll dial back our initial growth from 10% to 7%. This result implies a P/E of 18.4 times, much closer to Coca-Cola's five year average. 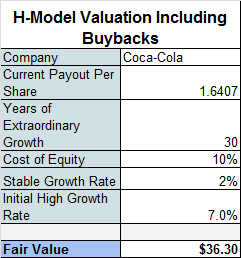 For Coca-Cola, at least, it seems more consistent to include buybacks in the model since 42% of its distributions to shareholders came in the form of buybacks over the last five years. If we're just counting dividends, we might be excluding a meaningful amount of value in our estimate. As long as the company hasn't consistently overpaid for its own stock or borrowed heavily to fund the buybacks, I have no problem including buybacks in the total payout equation. Regardless of which valuation approach you use (relative valuation, DCF, DDM, etc. ), it's imperative to consider different scenarios, since your baseline assumptions will not likely come to pass. In this example, I've kept the stable growth and cost of equity constant and tested the years of extraordinary growth and initial high growth rate variables, but you can certainly test the other variables, as well. Any time I write about valuation, I feel a bit like the mother from A Christmas Story after Ralphie gets his Red Ryder B.B. gun -- "Don't shoot your eye out!" A model that's inappropriately used can have negative consequences, so be sure to enter accurate historical data and use reasonable forecasts. That said, give the H-Model a try on some of the companies on your watchlist and let me know how it works out for you. What type of investing strategy do you follow? For years, the answer for investors has generally been limited to "value" or "growth" -- either you adhere to the value principles of Benjamin Graham and Warren Buffett or you follow the trails blazed by famous growth investors like Peter Lynch and Philip Fisher. Now it's time for a third strategy to be fully recognized by the investing community -- income investing. Plenty of academic research supports equity income investing as a distinct strategy, but to date it's been largely considered a sub-category of value investing. This makes some sense, since a high yield can sometimes be indicative of an undervalued stock, but the objective of a pure income strategy differs from value investing in that its primary focus is to generate a growing and sustainable stream of dividends. Capital gains are an important, yet secondary concern. For value investing, the opposite is true -- indeed, companies don't necessarily need to pay a dividend to make it an attractive investment to a value investor. Further, income investing has a distinct research process that focuses on a company's ability to sustain and increase its dividend. Where value research typically begins with a company's balance sheet and growth research starts with the income statement, dividend research commences on the cash flow statement. From the cash flow statement, for instance, we can determine free cash flow coverage, earnings coverage, how the company approaches dividends versus buybacks, debt repayment trends, acquisition trends, and more. This analysis is critical in determining a company's dividend health and therefore the cash flow statement is the necessary starting point for dividend research. For an initial £10,000, you will have received £36,135.50 in income and be sitting on an investment in the fund worth £71,155 today. That would make the total return more than £107,000 if you did not reinvest income - but around £190,000 if you did....(The fund) has paid out £3.255 billion in dividends since 1994. Woodford doesn't shy away from making dividend sustainability and growth a primary investing objective. For example, the objective of the Invesco Perpetual High Income fund is to "achieve a high level of income, together with capital growth" and one of the primary objectives of the Edinburgh Invetsment Trust is to grow "dividends per share by more than the rate of UK inflation." Surely these income-focused objectives are distinctly different from those of traditional value investing funds. At this point you might be rightfully asking, "Isn't this just splitting hairs? Why does this matter now?" With investors increasingly turning to dividend-paying stocks as a result of low interest rates and demographic changes, now is the ideal time to carve out income investing from the traditional value-growth spectrum. True, interest rates will eventually increase, but the demographic change will be with us for some time. According to a 2009 study by David E. Bloom, David Canning, and Günther Fink at the Harvard School of Public Health, "The share of the population aged 60 and over is expected to increase dramatically in every country in the world between 2000 and 2050." The 60+ cohort will increasingly turn toward income-generating securities such as fixed income and dividend-paying stocks. In addition, their investment objectives will shift to capital preservation and further away from capital growth. As such, investors seeking income may not find refuge in either the traditional value or growth strategies, so carving out the income strategy as a separate approach will be helpful to many. 1. Income first: Naturally. The most important difference between income and the value and growth strategies is that its primary focus is on income generation, with capital gains being a secondary concern. More specifically, the focus is on generating a sustainable and growing stream of cash flow (at least the rate of inflation) and avoiding dividend cuts. If this can be accomplished, capital gains should take care of themselves over time. 2. Conservative stock selection: Because capital gains are secondary in the income strategy, adherents have little need to swing for the fences with each investment. A stock doesn't necessarily need to be substantially undervalued (as is the case with value) or have considerable growth potential (as is the case with growth) to be a suitable investment in the income strategy. This doesn't excuse income investors from doing due diligence and valuation work -- far from it! -- but a modestly undervalued stock with moderate growth potential can make for a fine income investment even if it may not pass traditional value and growth screens. 3. Management matters: The income strategy seeks out companies with management teams (and boards) that are committed to sharing the company's prosperity with shareholders via regular and growing dividend payments. While buybacks and acquisitions can be reasonable alternative uses of free cash flow, they too often reward former shareholders (buybacks) and other companies' shareholders (acquisitions) at the expense of ongoing shareholders (dividends). Ideally, the company will strike a good balance between dividends, buybacks, and acquisitions -- one that enhances the company's long-term value. 4. Patience: The benefits from steady dividend income are fully realized with time and patience. Accordingly, there's little reason to trade or make short-term decisions in an income portfolio. Where a strict value investor might sell a stock once it reaches its intrinsic value, income investors are under no such pressure as the focus is on the cash flow stream provided by the stock's dividend. Certainly there are still good reasons to sell a stock -- the investment thesis is broken, the company's financial health is worsening, there are better opportunities elsewhere in the market -- but these reasons aren't exclusive to any investing strategy. 5. Low costs: Since taxes and trading commissions reduce realized returns, it's essential to minimize the effects both in the income strategy. The tax treatment of dividends varies by country, and in some cases dividends may be tax disadvantaged relative to capital gains -- that is, where the tax rate on dividends is greater than on long-term capital gains. And because dividends are typically paid on a semi-annual or quarterly basis, they create more frequent taxable events than a long-term capital gain that can be deferred until the shares are sold. As a result, it's important for income investors to practice proper asset location by holding dividend-paying shares in tax-deferred plans to the extent possible. Excessive trading also increases costs as commissions and stamp duties (where applicable) create a drag on results and should thus be practiced only when necessary. It's time for income investing to take its rightful place alongside the growth and value investing strategies and be recognized as a separate school of thought with its own set of guidelines. Philip Fisher, Common Stocks and Uncommon Profits and Other Writings . John Bogle. The Little Book of Common Sense Investing . Pat Dorsey. The Five Rules for Successful Stock Investing . Howard Marks. The Most Important Thing . Robert F. Bruner. Deals From Hell: M&A Lessons that Rise Above the Ashes. Aswath Damodaran. The Little Book of Valuation. Aswath Damodaran. Investment Fables: Exposing the Myths of "Can't Miss" Strategies. Josh Peters. The Ultimate Dividend Playbook. Don Schreiber, Jr. and Gary Stroik. All About Dividend Investing. John Del Vecchio and Tom Jacobs. What's Behind the Numbers? Michael Mauboussin. The Success Equation: Untangling Skill and Luck in Business, Sports and Investing. Michael Mauboussin. More Than You Know: Finding Financial Wisdom in Unconventional Places. Stephen T. McClellan. Full of Bull. Joel Greenblatt. The Little Book That Beats the Market. Burton Malkeil. A Random Walk Down Wall Street. Peter Bernstein. Against the Gods: The Remarkable Story of Risk.